Biologists classify oak trees as seed plants, reproducing through flowering and producing seeds. Over 80 species of oak trees grow in North America. Oak trees are deciduous trees, and all varieties feature furrowed bark and toothed leaves. Oaks hold a place of economical significance in North America by providing a hard wood used in flooring, furniture and construction. The life cycle of the oak tree begins with the germination of an acorn. Favorable soil conditions allow for the acorn to send down a tap root. Shortly after germination, a young oak shoot emerges from the ground as a sapling. According to World Book, oak trees grow very slowly and live up to 400 years. Oaks vary in size and type of growth. Some remain as small as shrubs, while others grow to heights exceeding 100 feet. Despite being deciduous trees, those located in warm climates will not shed their leaves in fall and winter. Oak trees are considered fully mature once they begin producing acorns, usually at 20 years old. In the spring, oak trees produce often unnoticed yellowish-green flowers. 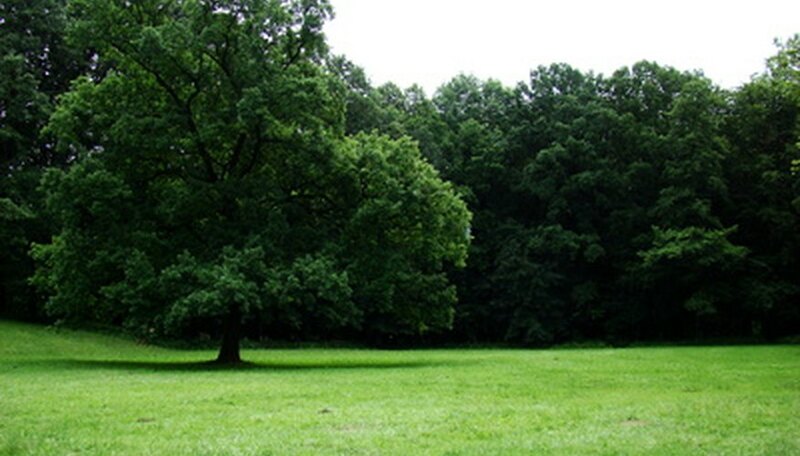 Oak trees are monoecious, which means they produce both male and female flowers on the same tree. This gives every single oak tree the ability to produce acorns. Rising temperatures trigger the flowering of oak trees. Male flowers, known as catkins, look like a string of beads hanging from newly formed branches. The female flowers often need locating through the aid of a magnifying glass. Closely resembling leaf buds, the female flowers form on new twigs at the base of emerging leaves. Within two weeks of flowering, the catkins produce pollen. Pollen production lasts approximately three to four days. Three small red stigmas protruding from the female flower collect pollen grains from the catkins. Female flowers contain six ovules containing eggs. However, only one ovum will become fertilized, growing into an acorn. The maturation of the acorns depends on the species of tree. For example, some oaks may flower in the spring and drop mature acorns during the fall. Others hold their acorns throughout the winter and drop their acorns the next spring. Acorns are heavy seeds that fall and land in close proximity to the parent tree. Animals provide the majority of seed dispersal, especially squirrels. Acorns may also roll downhill or fall into running water, moving them away from the parent tree. Over time, the acorn becomes covered by soil and leaves, providing the proper environment for germination. The University of Tennessee Institue of Agriculture: How do Acorns Develop?